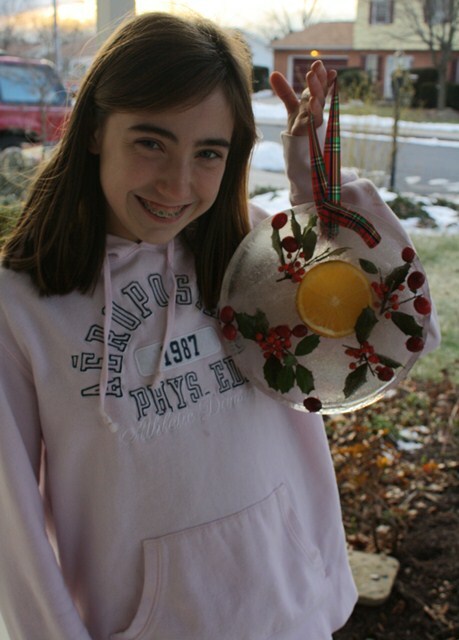 My daughter Kelly created Christmas-themed ice art, winter 2010. The saying goes when life hands you lemons, make lemonade… So when mother nature brings cold weather your way, embrace it and make a (temporary) piece of artwork out of ice! This is a project my children and I have made many times through the years. I think we originally stumbled upon the idea in Family Fun Magazine. But I don’t think this project is only for children… I think children of any age, including us moms and parents, can get our creative juices flowing with this one! 1. 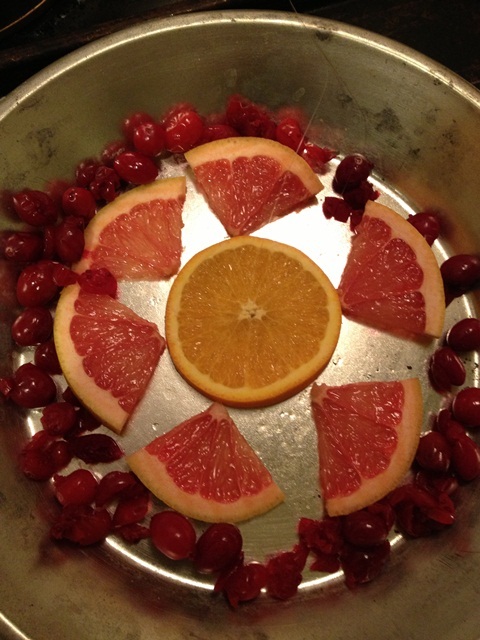 Arrange your fruit slices, berries or natural items in a pattern of your choosing, inside the pie pan. 2. Take a length of your string, yarn or fishing line. Knot the ends together, tightly, to form a loop. Place one end of the loop inside your pie pan. -Or- Thread one end of the string through your citrus slice and knot your string so that it’s anchored to the orange or lemon. 3. Place the pie pan on a cookie sheet and then transport outside in the cold. Even if the temperature is below freezing, avoid sunny areas. 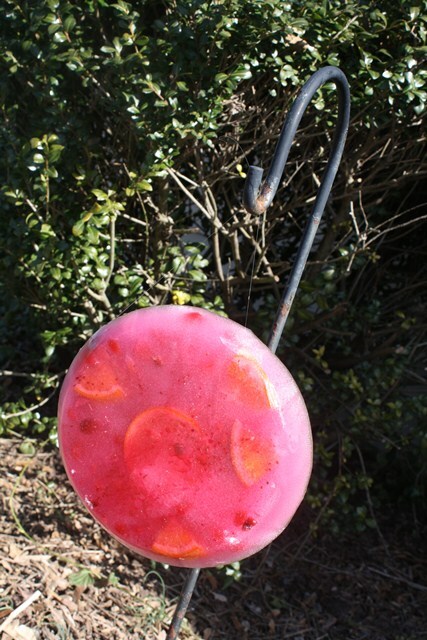 Warning: cranberries may result in PINK ice art! But this recent creation tied in nicely with Valentine’s Day. 4. Very slowly, pour water into the pie pan so that it’s deep enough to cover your design, about 1/2 – 3/4 inch deep. Make sure that the string is going to freeze within your design. If your design shifts when you pour the water, slide things back into place or wait an hour or two and rearrange when the water starts to turn icy. 6. Dip the pie pan under hot water at your kitchen sink and loosen the ice from the pie pan. 7. Hang your icy artwork on a porch or from a shepherd’s hook for a beautiful, winter time decoration! This project will “hang around” for several days (or even weeks depending on your climate) if you have an extended period of time when the temperature is below freezing. If you try this project, I invite you to upload a photo to our Facebook page and share your creativity!